Voice #1: It's not so bad. You can pick up stitches around the wrist and add 10 rounds. Voice #2: The project is so small, you can just frog it and start over. Voice #3: Il faut que tu arrêtes de fumer la moquette! How can you screw up something that is supposed to be "mindless"?! "Il faut que tu arrêtes de fumer la moquette" literally translates to: you have to stop smoking the carpet. I don't know if I use this phrase correctly, however I like to use it in place of : you have to stop smoking crack. I can't recall if I have ever learned the subjunctive verb tense/mood in French. I really don't think it was ever covered in any of my French classes! Of course this was aeons ago and my memory is not what it used to be. Anyhow, I have somehow picked up bits and pieces of the subjunctive over the years and am still trying to get a good grasp of how to use it. The subjunctive mood is used when there is uncertainty, opinion, wish (or order or obligation), or feeling. The indicative mood is used when there is certainty, judgment, promise (or resolution or decision), or observation (or declaration or statement). One thing that has stuck in my mind is that the impersonal expression il faut que is followed by a subjunctive verb. So in the phrase "il faut que tu arrêtes...", the verb arrêter (to stop) is in the subjunctive. Unfortunately this is not evident since the 2nd person singular conjugation of arrêter is identical in both the (present) indicative and (present) subjunctive. One would have to contrive to use a verb where the conjugation is different in order to demonstrate that one understands when to use the subjunctive. So I thought I was done with the main part of this mitt and was getting ready to bind off. Sure it looks fine in the photo above. ... you see where the problem lies! 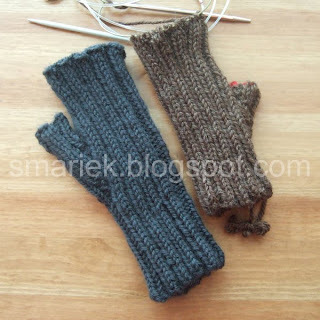 The wrist-to-thumb-gusset section is too short. I tried on the mitt and it is even too short for my small hands. This is supposed to be larger, for a guy's hand. 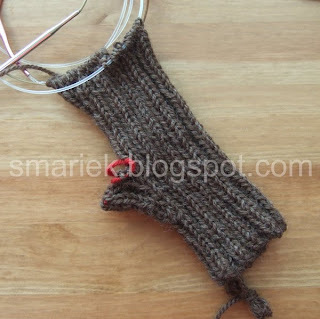 What I should have done was knit 10 more rounds before starting the thumb gusset. I have no idea how this happened. I was probably engrossed in whatever we were watching on TV. The funny thing is that this is supposed to be a "mindless" knitting project! I could do as Voice #1 suggests. It would be the quickest workaround and it would probably turn out OK. But I would know about the blunder and that would bother me even though the mitts would be gifted and then I would never have to see the blunder. I ripped back to the top of the thumb gusset (where the red yarn was holding the thumb stitches) and then used my needles to pick up stitches on that round. Then stupid me went on to knitting onwards from that point for several rounds before I realized that I should have ripped back to the bottom of the thumb gusset. Ack! Lookie at this boo boo! The mistake is inside the red circle. The purple circle shows what it should have looked like. It looks like a K2Tog gone bad. I didn't notice the error because my stitch count was correct and didn't pick up on any problems as I was knitting the following row. I will defer to you on the subjunctive, since I barely remember that there is one! Sorry about your mitt. I've "smoked the carpet" like that before, too. And the lace? I can only drop back 2 rows, max. It looks like there's an rogue YO there, too. Definitely worth a tink! Going backwards? You mean that's not how patterns are supposed to work? Two rows forward, one back? Huh. Got to Row 130 on DH's sweater and after holding it up to him, realized I needed more length before the collar split. Ergo, frog back to row 80. Such fun. Not. Hang in there, Marie. Hope you feel better, too. Thanks for the French lesson! It's a language I'd love to learn someday. Sounds like that basic ribbed wrist warmer is giving you fits! Don't you hate it when a mindless project slaps you in the face and says, "See what happens when you knit me sans mind?" Okay...maybe your project don't say that. I'll go now. Nice blog and fabulous scarves. I do appreciate your french lesson, although it is a little above me at this point. We all go thru phases where things just happen. What a champ you are to share them with your readers, it shows you're human after all, then when we make mistakes we won't feel so down in teh dumps about it. Oh, ouch! The mitt would bug me a lot more than the lace. I've successfully dropped stitches back in lace, but it takes a lot of patience and absolutely no interruptions of any kind (including the cat needing a head rub). I can't see your pictures. Don't know why!